Thank you for contacting this help desk certification article. Your attention is important to us. Please read carefully, as the contents of this article could improve your life dramatically. If you are seeking help with relationships, food or vending machines, you apparently think the help desk can give you definitive answers to all of life’s questions; please move your cursor to the top right of your screen and click on the X. If you are seeking ideas on how to earn a Helpdesk Administration and Management Certification, please use your twin-calibrated, spherical visual scan devices (your eyes…we mean your eyes) to process the seven discrete bits of numerical data below. A good help desk certification program respects your time by avoiding repetition and emphasizing useful skills. You can receive certification that builds on your basic computer skills and be on your way to a great possible career path with only 200 contact hours. These classes will meet after work, so you can continue to work at your current job while working on building a great future. With four, 50-hour classes (because taking 200, one-hour classes would be silly) in important topics that transform you from ordinary IT work to Solver of Problems, Fixer of Ills—you get the information you need to help callers and on-site employees solve their computer emergencies. You probably already know a lot about computers, and you already realize a computer emergency could mean anything from network connectivity issues to misusing the DVD drive as a coffee cup holder. Taking some core classes in computer organization, networking, and network security could help you feel confident enough to solve nearly every help desk issue, in person or by telephone. Earning certifications to move into a help desk position is work, and do not let anybody kid you about this. Classes may meet five hours at a stretch, and after a day of your income-generating work you may be challenged to maintain attention and focus in ten, five-hour classes. If you keep in mind your goal and stay true to your dream, you will realize the short-term sacrifice is paltry compared to the years of personal and financial rewards that could be ahead of you. 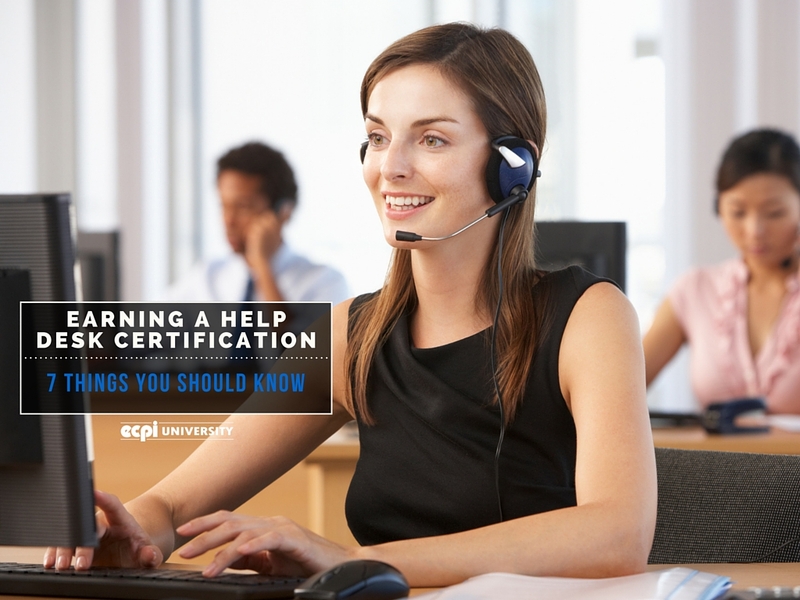 Can You Make More with a Help Desk Certification? 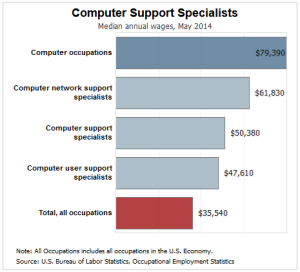 By getting your help desk certification, you could be on your way to a possible career beside the more than 766,000 other computer support specialists currently working. With everything else preoccupying your adult, professional life, you may not have time to spend a few years earning a higher degree. Twenty weeks, though? Less than half a year of classes, by contrast, gets you the Professional Development Certificate and a quick step closer to working professionally on a help desk. You take no extraneous classes; just the four courses that could transform you into a superb help desk specialist. If you are concerned about your prerequisites, many professional development programs start with courses needing little to no previous experience. You do not need a college degree to gain a professional development certificate. This means the 20-week, 200-hour program is ideal for veterans, job-switchers and other older professionals. ECPI University’s Professional Development Center could be the ideal place to attend classes and earn your help desk Administration and Management certificate. With just four classes and only 200 contact hours at either of our two locations, you could quickly and efficiently gain the knowledge you need to provide superior customer support in any of the fast-paced industries needing help desk talent. Contact ECPI’s Professional Development Center today to learn more.